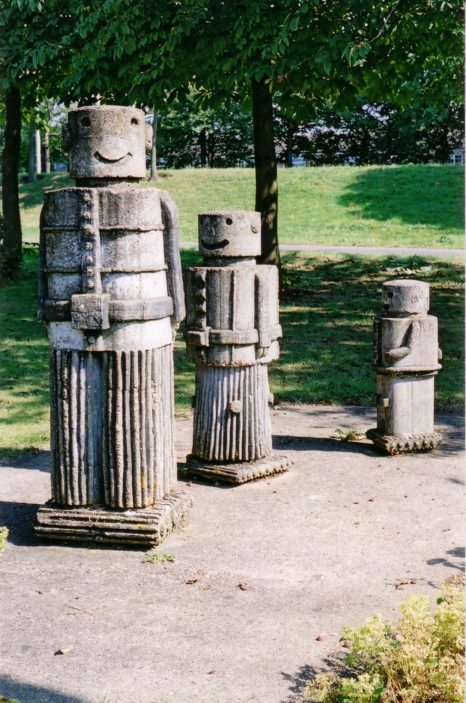 Simon Jones was responsible for this and other quirky sculptures in the Symonds Green area. Simon Jones graduated from Barnet College of Art, and spent his first postgraduate year working for Glenrothes Development Corporation under David Harding, before being employed by Stevenage Development Corporation c. 1974 – 1980. 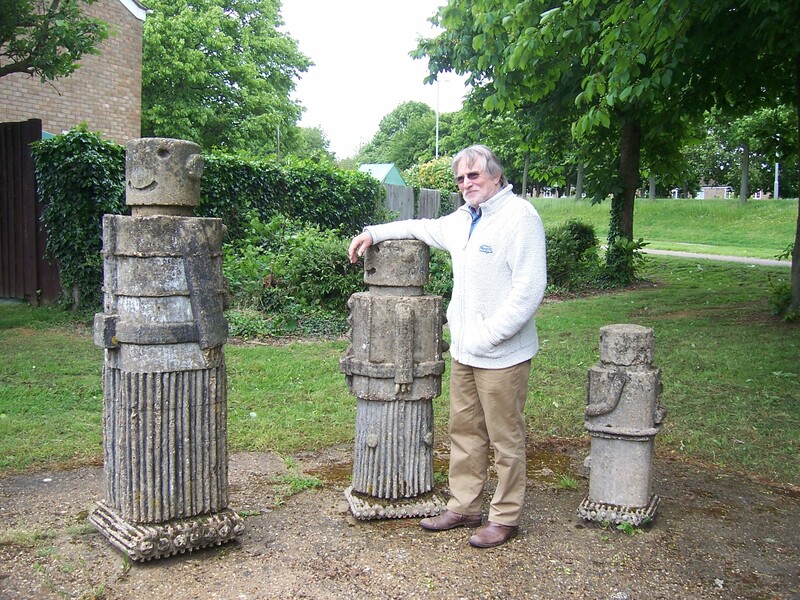 Now semi-retired from the recorded music industry, he visited Stevenage in June 2015 to investigate the possibility of restoring some of the concrete sculptures as part of a community project. This page was added on 20/12/2010. I guess a four-year delay in responding hardly constitutes a conversation – sorry Andy – a friend who also used to live in Stevenage kindly sent me a link to this page! I’m the Simon Jones that made the Robots, Playing Cards, Wonky Clock, and a few other sculptural highlights here and there. I’m amazed they’re still standing! They look like they could do with a lick of paint – they were brightly painted, and having seen the photos, I’d love to come back and give them a refresh. I wonder if anybody would mind? Once Stevenage Development Corporation was wound down, I moved into the music and recording industry – moulding in sound rather than concrete, and although now partially retired, I’m still involved in that industry. Simon! I would love to be involved in organising that return to Stevenage so lets make it a reality! Interesting about the music as only last week I came across a newspaper article which featured you and your partner setting up ‘The Crypt’ studio at the old St.Pauls church in Broadwater – I remember visiting it with you when you were first fitting it out! Amazing – it would be good to make direct contact – do you mind if I source your E address from this sites manager? We’ve been trying to find a contact for you for years! This was one of Simon Jones’ works. I was an architectural trainee at Stevenage Development Corporation from 1976 to 1980 and Simon, as ‘town artist’ was attached to one of the two architects studios, which existed on the 4th & 5th floors of Daneshill House. Simon did a lot of work with local communities and their children – other works in Symonds Green included some large (dinosaur?) footprints and a couple of others I can’t recall now. He was a lovely guy and one who I would love to know where he moved onto.